On its 85th anniversary, Petron Corporation, the country’s number one oil company continued to uphold its commitment to ensuring the sustainability of the communities it serves. 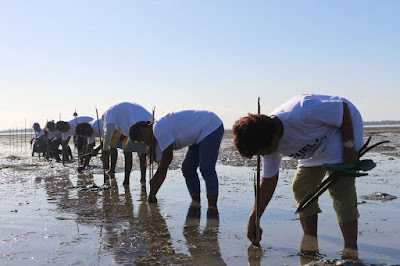 Residents from Petron’s fenceline communities, local government representatives, and local DENR offices joined Petron employees in nationwide reforestation efforts through the company’s “Puno ng Buhay” program, which aims to build Petron forests of mangroves, bamboos, or endemic tree species. The program came in full swing in 2018 as Petron adopted at least 85 hectares for reforestation in different areas around the country. The sites in Puerto Princesa, Palawan and Nasipit, Agusan del Norte were populated with mangrove propagules while the area in Tagbilaran, Bohol was planted with bamboo seedlings. Similar activities were also held in other areas including Tacloban, Roxas, and Limay. This brings the total hectarage of reforested sites to over 100 and the total number of mangrove and tree seedlings planted to over one million since the program was formally launched in 2016. Petron remains steadfast in its commitment to fuel the environment as it plans to adopt more areas for reforestation in Cebu, Iloilo, and Davao this year. “As we mark our 85th year, we hope to leave a significant and lasting impact on the environment and in communities where we ae present. We see ourselves as an enabler of growth and progress, so ultimately we help shape the future where our country is stronger, more resilient, and able to meet the aspirations of our people,” said Petron President and CEO Ramon S. Ang. In the next three years, this nationwide reforestation program is expected to see at least 200,000 new trees and mangrove planted. These areas are expected to capture at least 63,000 tons of carbon annually. With the continuing decline in forest cover, Petron hopes to further contribute to government efforts to protect the environment, especially through DENR’s expanded National Greening Program. Achieving this massive undertaking means tapping into the volunteerism spirit of Petron employees and the company’s stakeholders to take collective action. Thousands of Petron employees have contributed to the success of Petron’s environmental efforts. In addition to the Puno ng Buhay activities, they have helped clean up shorelines, rivers, and creeks, and distributed empty drums to serve as waste bins for fenceline communities. Many of these activities are timed to commemorate global events such as Earth Day, Environment Month, and International Coastal Cleanup Day. Petron is an integral part of the community, as with all other areas where it operates, enabling economic growth, generating employment, and making a difference in the lives of those who need help the most. This is a goal that Petron readily and fully embraces for the next 85 years and beyond.